Will Bear get a vacation from Duck? Will Duck survive Bear’s absence? 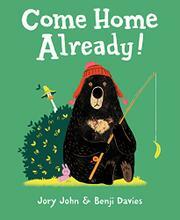 When Duck goes for his daily visit to his neighbor Bear’s house, he finds a sign on the door that says “Gone fishin’ / Back next week.” Duck can’t believe his friend left him behind. Trekking through the woods, Bear’s happy to be away from his intrusive neighbor. Duck’s not—he can’t find anything to do with himself (and he tries a lot of diversions). But Bear does not find camping as easy as he thought; he’s not successful at fishing…and the woods can be scary at night. Something spooky comes out of the woods—much screaming ensues—but it’s only Duck, come to check on Bear and bringing his camping skills (and snacks). Bear’s actually glad to see his neighbor; camping’s more fun when not alone…but solitary Bear isn’t so sure how he feels when, once home, Duck says, “I’ll always be by your side, Bear. Always and forever.” John and Davies team up for a third (and possibly the best) tale of reluctant, one-sided friendship. The story, told entirely in the characters’ monologues (with a bit of dialogue toward the end), is dynamic and begs to be hammed up during read-alouds. Davies’ bright and funny illustrations are equal partners in the telling of the tale and its humor—Bear’s expressions say it all.